Playing a sport is an amazing and guaranteed way to stay physically active, but sports might not be in a child’s life forever. Injuries, time commitments and other factors may make playing a sport difficult. Luckily, coaches of youth sports activities can encourage children to stay physically active outside of sports. Encouraging children to engage in physical activities outside of sports teaches a very important lesson — that physical activity is a lifestyle choice. The following are some examples of physical activities coaches can encourage their team to engage in that will help them lead an active lifestyle long after they have stopped playing sports. Walking up a single flight of stairs, according to the University of New Mexico, can help individuals burn approximately 15 calories. Instead of pushing the elevator button and riding to the desired floor, coaches can encourage their team to take the stairs. Young athletes are often focused upon only building the skills needed to take part in a particular sports activity. Cross-training can help these young athletes not only work on strength and cardio conditioning, but learn valuable skills that will last a lifetime. Starting children young on a very basic cross-training program teaches them that there are more ways to be active than playing on a basketball court or soccer field. Children learn that they can build muscle strength and stay fit while cross-training. Walking helps strengthen muscles, increase blood flow to the body, and decrease stress and blood pressure. Young athletes should be encouraged to incorporate the casual walk into their daily routine. Taking a 15- to 20-minute walk every evening can really help children. It will help get them into the habit of doing this physical activity on a regular basis. Hopefully, it will become second nature and they will continue walking long after they have stopped taking part in sports. Children are quick to hop in the car to get wherever they need to go. Coaches can encourage their team to stop riding everywhere and bike to nearby locations. Cycling can be extremely invigorating. It builds upper and lower body strength, increases blood flow and burns calories. Computers, video games and engaging television shows all encourage children to sit for prolonged periods of time. Instead, coaches should encourage their athletes to get up and move around every so often. Children often have a one-track mind, especially when they really enjoy a particular sport. Encouraging children to try other physical activities outside of their sport can help them realize there is more to the world. Coaches can encourage their team to try other activities by incorporating them into their practices or extra-curricular activities. Coaching staff can try to arrange for the team to try out different physical activities, such as jogging, hiking, yoga or Pilates. If children enjoy engaging in this activity, they will continue to participate for many years. There is no way children aren’t going to play video games, so why not encourage them to turn it into a physical activity? 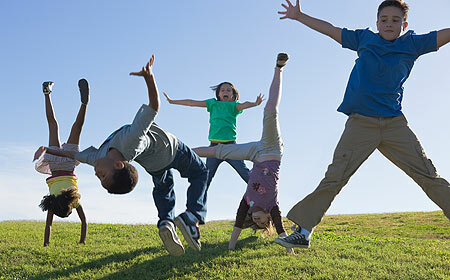 There are a number of games that encourage children to get up and move around while playing. Coaches should encourage their team to try these games out — maybe with a team video game night! Physical activity is a lifestyle choice, not something that instantly happens. Coaches of youth sports can encourage younger athletes to start incorporating physical activity into their daily lives by recommending these activities.